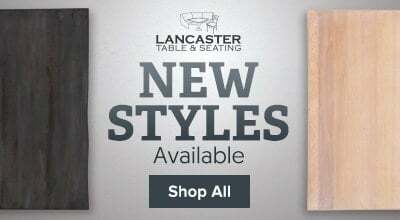 Keep your guests comfortable with the Lancaster Table & Seating Spartan series metal window back chair. 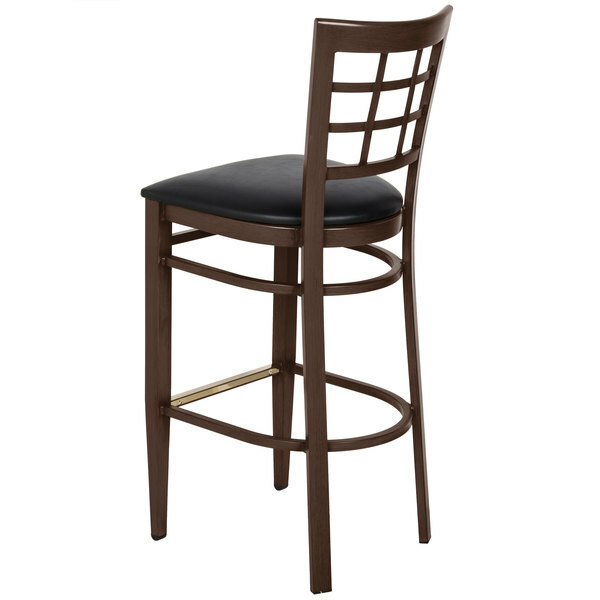 The Lancaster Table & Seating Spartan series metal window back chair with walnut wood grain finish and black vinyl seat is the perfect seating solution for any pub, tavern, or bar. 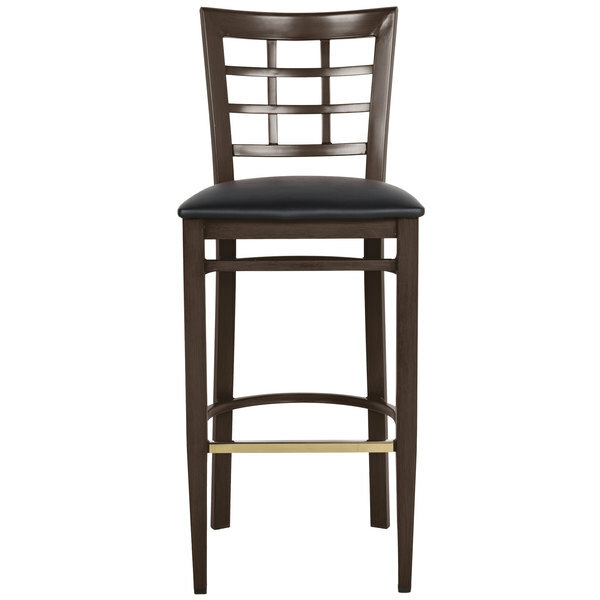 This product comes in a tall bar height that allows your guests to comfortably sip on your signature cocktails while they sit at your bar. 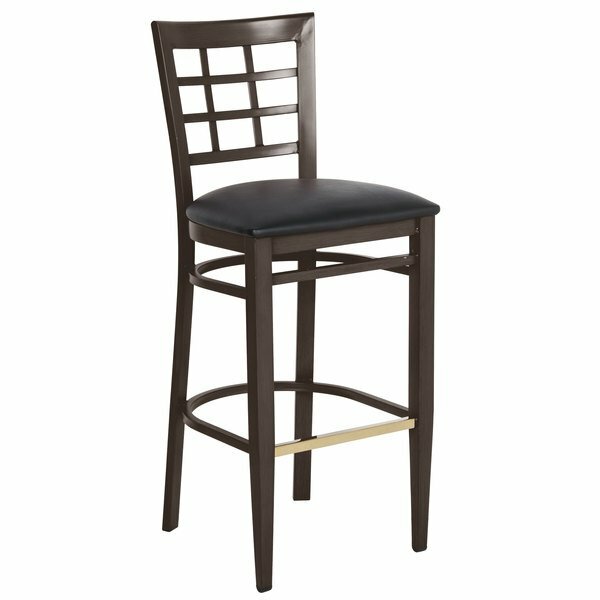 Thanks to its durable metal design, this chair is sure to be standing for a long time in your establishment. 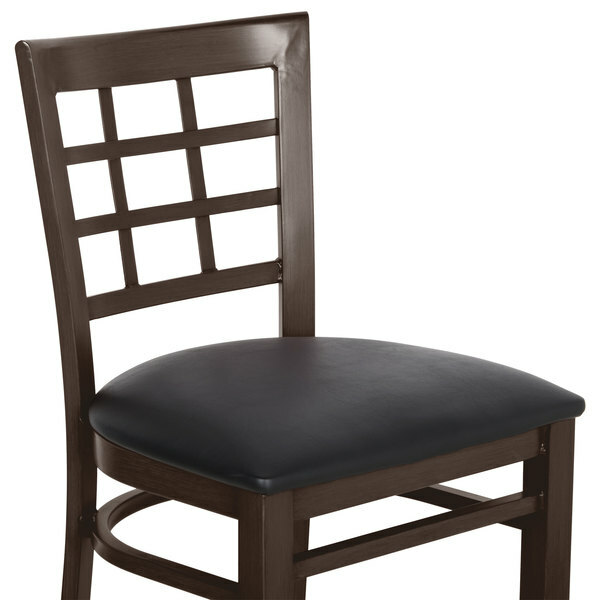 With a 2 1/2" thick padded seat and contoured window back, this chair will keep your guests comfortable during their stay in your establishment. Thanks to a unique metal construction, this chair boasts a high weight capacity of 500 lb. 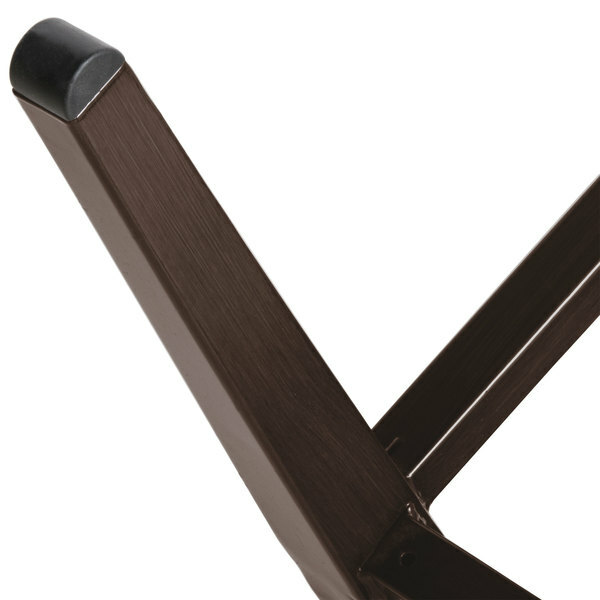 This durability makes this the last chair you will ever need to buy. 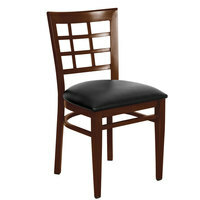 You can choose whether you want this chair shipped fully-assembled or broken down. If you choose the assembled chair, you can use it as soon as it arrives, while assembling it yourself is the more economical option. The plastic glides attached to this product protect your floors from scratches and scuffs. Not only does the gold plate provide your guests with a place to rest their feet, but it also guards against wear and tear. The unique finish on this product is resistant to stains, scratches, and smudges, keeping your chair looking great through long-term use. 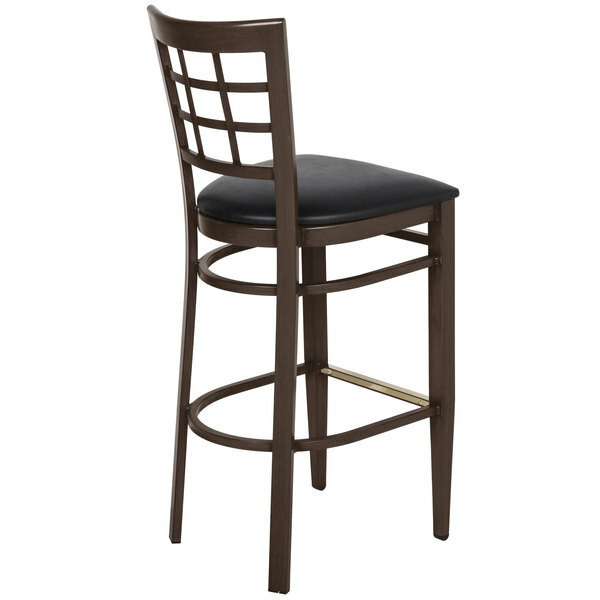 Complete your bar, restaurant, or buffet's look with Lancaster Table and Seating's Spartan chairs and barstools! Available with a variety of finishes, seat backs, and seat color combinations, this series is durable, unique, and stylish. 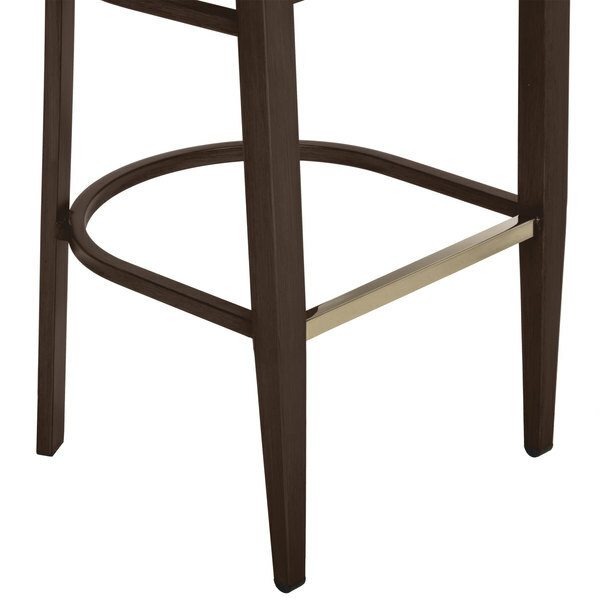 The Lancaster Table and Seating Spartan series of metal chairs and bar stools offers a sturdier alternative to wooden seating without sacrificing the look that you want. 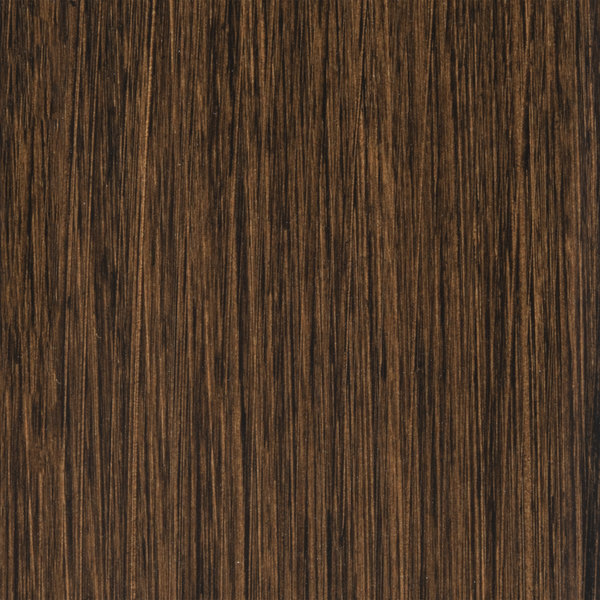 Combining durability, variety, and a unique, wood-grain appearance, the Spartan series is perfect for bars, restaurants, buffets, and more! Finding the right chairs for your business can be tricky. 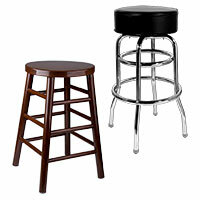 You want to create a distinct, cohesive decor, but you also need something comfortable and reliable. This collection delivers all that and more with a wide range of finishes, seat backs, and seat color combinations to choose from. You can pick the look of natural wood, mahogany, or walnut, all with a real, wood-grain appearance to best suit the theme that you're going for. 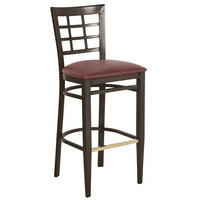 Then, pair it with a seat color of your choice with options like red, navy, burgundy, green, or black! Finally, select the seat back style that you want to complete your custom look. These chairs boast an impressive 500 pound weight capacity, which is up to two times stronger than traditional wooden options. Metal is also much less likely to become scratched or chipped. 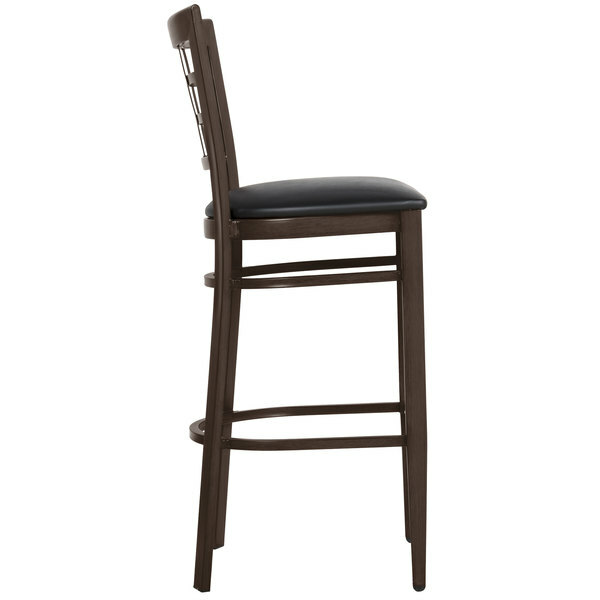 This added resistance and stability helps give you peace of mind while dramatically increasing the service life of each chair or bar stool. 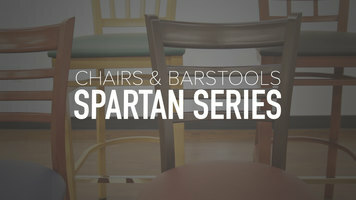 With such amazing reliability and attractive, wood-grain styling, the Spartan series takes restaurant seating to a new level, making them the last chairs you should ever need to buy.